All repairs and work is done to the standards set by your vehicle manufacturer ensuring your car runs and drives as if it had just come off the showroom floor. At Blackhills CARSTAR Autobody , we use state-of-the-art three dimensional measuring and digital imaging systems for frame restoration and all uni-body repairs. 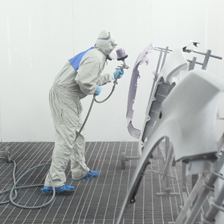 We have only the most experienced and dedicated Refinish technicians working in our shop. All of our technicians are I-car certified and have an extensive background in the automotive refinish industry and are certified color match experts! Count on us to get your car to pre accident condition. Whether your vehicle needs a Windshield, or your RV needs body repairs, our ASE and I-Car certified technicians have the skills to handle all of your automotive and RV, glass and repair needs. Using state-of-the-art equipment, we are able to accurately repair and restore your vehicle. We can handle any repair on any vehicle.